I'll start with an admission, this is my first time actually participating in a multiple open online course or (MOOC). For those not familiar with this concept MOOC's are courses designed by many different institutions and collaborative groups offering, anyone to participate for free, in mini courses that typically last over 6 weeks (though each 'week' may take a fortnight to appear!). They're a bit of fun, an opportunity to set back and engage in something different. As a medical student (year 4 out of 5 at Dundee!) I'm primarily participating in a course, but in part of this I'm co-designing an OOC (open online course) for students to gain skills in digital literacy, online resource development and feedback. This has originated from several conversations around the notion that students don't know what they don't know, that they're frighteningly obsessed with exam passing to the disinterest of the 'fluffy' classes and that skills in digital learning are somewhat lacking. The Why of our course is to address the aforementioned issues using an OOC approach, the medical degree, by nature is rammed. There is never enough time to learn everything so why bother offering an extra course? I'll begin with mentioning #FOAMed a movement started online by Mike Cadgoan with the notion that medical education resources should be FREE, that's right, free. There are endless textbooks and pay for use resources out there, they're shiny, their professional and they're not particularly fun. #FOAMed provides an opportunity for the everyday voice to be heard, for the 'need to know' to be backed up with anecdotal discussions from the coal face. But how do we, the everyday voice get skilled in developing these resources? How do we immerse ourselves in creating these resources unguided? The answer is through time consuming, unsustainable input that, at least within my institution, reinvents the wheel on the year, every year (Crossfit in-joke). Communities of practice as a student at university are fleeting, you join a class in year 1 of med school, sitting there with hopes and dreams, aspirations and unrealistic expectations. With time you fade, mould and shape into the future professional in the making, community plays a role in that, but it shifts. People dropout, repeat years, leave and as you hurtle towards graduation. There's a chasm in the community between staff doing the teaching and students being taught.... of course there are exceptions but it's not the norm and blurring this will allow progression of the community, merging of minds and skills.... having students teach the teaching staff is a fun notion. This is the why *I* teach. 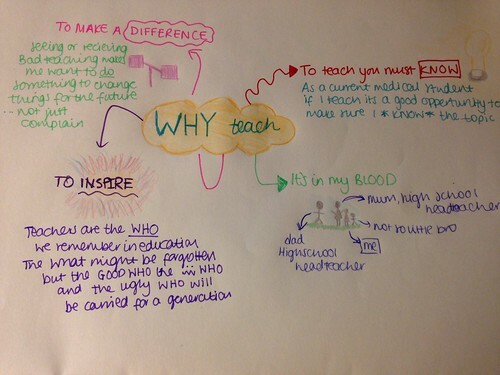 Why should a student teach? The weathered answer is that our governing body the General Medical Council requires us to teach as new graduates. It's likeable to have it before graduation... essentially it's not that easy to avoid doing it. But that's not my why. Part is that I grew up in a teaching house, I lived the daily successes and failures in teaching high school. Inspiring people may sound corny and I don't really mean the big showy motivational speakers, I mean the teachers who believe in your future, in your capabilities, in you. I want to be that person, that cheerleader, that voice and give back for all the years of education I've received. And finally, the most important one as a student, in order to teach (or peer teach in my case) you must know the topic, be confident in what is being covered and that is priceless when your own exams are right around the corner. This is the a road test of #meduocc1 a new open online course being developed at Dundee University by staff and students collaboratively. This week centres around copyright material and looks at giving healthcare professionals and students ideas and hints on how to avoid copyright pitfalls. This is extremely useful when being asked to develop online content and materials. Reading through the resources has certainly been an eyeopener in how easy it can be to work round copyright, but also how it can go wrong. 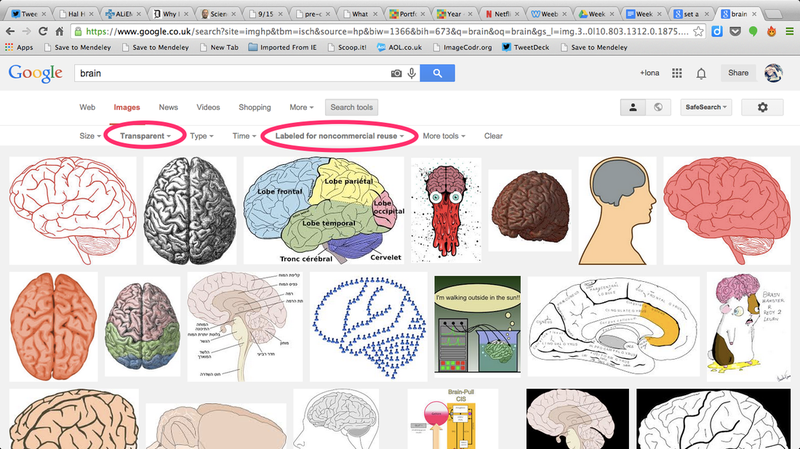 The first activity, using google images to search for 'brain' pictures yielded lots of results, something I was expecting. However, when I filtered these by 'noncommercial re-use' I was surprised how many images can be reused. Of course many of these were not appropriate for use in meded, in particular the wee chap on the bottom right hand screen. Moving onto the second activity, looking at filtering these images further by asking for transparent images it was interesting to see how many images were lost and the quality of those left. I expected more to be transparent, in particular labelled images, something that was lost post filtering. This limitation would make me consider whether or not to include transparent background vs. having a presentation look clean and slick. Activity 3 asked us to think about what kind of consent is needed for clinical images, for example taking a picture of an interesting rash on dermatology attachment. It is important and indeed good clinical practice to gain consent from a patient, and to state where images may be re-used. By asking for consent to use in wider public domains like conferences or on the open web, patients can be informed and you can ensure your resources can be used widely. where image would be used: closed university networks for teaching/conference material/open web online resources etc. Where images would be store. Finally, Activity 4 asked us to use a different search tool, and to use this to upload and image directly to our blogs. I decided to use flickr as this is a fantastic resource with inbuilt creative commons filtering. Creative Commons is an online movement where by those uploading resources can choose to make these widely and freely available for anyone to reuse under the CC licence. There's more information on this here: https://creativecommons.org/ There were 3 choices of search term to use, so I decided to focus on prescribing. As you can see from the image below I have included creative commons attribution. I did this by using a website calledimagcodr which double checked licence and generates HTML code for using in blogs. 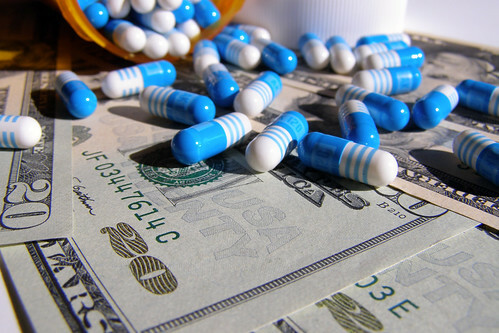 I liked this particular image because it highlighted the financial burden on patients in the United States. In summary I've learned about the importance of using appropriate images, gaining consent and attributing images appropriately. 4th Year Medical Student based at Dundee University. Content is all my own thoughts and opinions.